GPS pet trackers combine cellular and GPS technology to give you accurate information about your pet's whereabouts nationwide. They usually mount on the collar or the harness of your pet, and track its location. Some can also monitor your pet's activity and even the ambient temperature around your pet. To get these trackers working, you will first need to set up a safe zone (or safe place) limited by the distances that can be reached by the Bluetooth or Wi-Fi communication protocols (some trackers use Bluetooth, while other Wi-Fi to set up the safe place). The tracker will then notify you each time your pet leaves the safe zone and and returns to it. Note that once your pet is beyond the Bluetooth or Wi-Fi range, these trackers use cellular and GPS technology to enable tracking anywhere in the U.S. They can also allow you to set multiple safe places depending on where your pets spend most of their time. 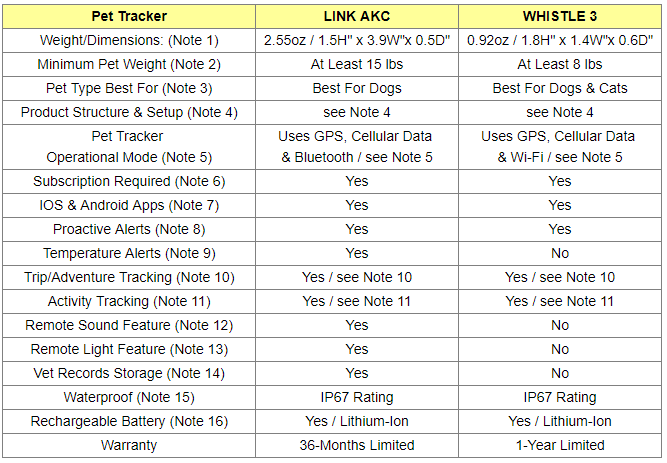 This article will compare Link AKC and Whistle 3 GPS pet trackers. At the time this article was written, these were the most popular GPS pet trackers on Amazon and had also received some excellent reviews from Amazon buyers. Whistle 3 tracker is small and very light, under an ounce. It can be worn attached to your pet's collar or to a harness. 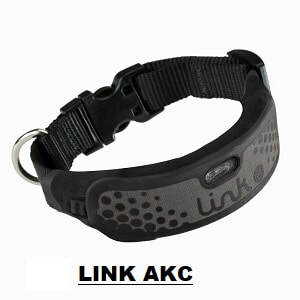 Link AKC comes with a collar, the size of which depends on your dog's size. The tracker itself has the same size and weight for all collar sizes, but it is heavier and larger than the Whistle 3 tracker. It has a slightly curved shape and is worn on the collar. Because Link AKC is heavier and bulkier than Whistle 3, it should be used on larger dogs (at least 15 lbs). Because Link AKC is heavier and bulkier than Whistle 3, it is not recommended for cats. The company states clearly on their website that it was not designed for cats. ​Whistle 3 can be used both on dogs and cats. A collar, the size of which depends on your dog's size, and that is naturally curved to fit the contours of your dog's neck Two styles of collars are available: Classic Leather or Sport. A collar carrier that is placed on the collar and that carries the tracker. It can be used with the provided collar or on any collar with a width between 0.5" to 1.5". A tracking unit that will sit on the collar carrier. A base station used to charge the tracking unit's internal battery and to define the safe zone for your dog. It also features a USB port to make it convenient to charge both the tracking unit and your cell phone simultaneously. A power cord to power the base station. Before the tracking unit can be used to track your dog's whereabouts, you need to download the ​Link AKC app to your smartphone and, using the app and Bluetooth, identify and register both the tracker and the base station. A collar attachment (it can also be attached to a harness). A tracking unit that will sit on the collar attachment. A charger for charging the tracking unit's internal battery. Before the tracking unit can be used to track your pet's whereabouts, you need to download the Whistle 3 app to your smartphone and connect both the tracker and your smartphone to your home's Wi-Fi network, To connect the tracker, the app on your smartphone will first need to identify it using Bluetooth. With Link AKC, the safe zone is the immediate area surrounding the place where the Bluetooth supporting base station is placed or the immediate area surrounding your Bluetooth supporting smartphone. When your dog moves away from the safe zone and goes far enough so that the tracker it carries is not reachable by Bluetooth from the base station or your smartphone, he (or she) will be considered outside the safe zone, and an alert will be sent to you smartphone to indicate that your dog is away! When the dog is outside the safe zone, the tracker uses the GPS to detect the dog's location and sends the information to your smartphone via cellular data. Notification via the cellular data comes within half a minute. Note that multiple base stations can be registered with the app; so, if you have a large home, you can have more than one base station optimally placed around your home, definining more than one safe zone for your dog. 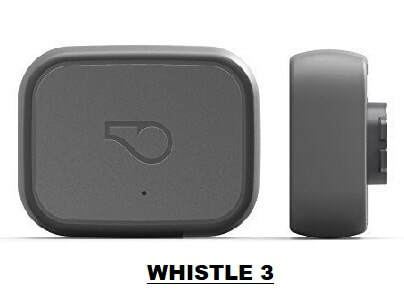 With Whistle 3, the safe zone is the immediate area surrounding a Wi-Fi enabled location to which the tracker is connected with Wi-Fi. ​The Wi-Fi enabled location can be your home, your office or any other place that is Wi-Fi enabled. When your pet moves away from the safe zone and goes far enough so that the tracker it carries is not reachable by Wi-Fi, it will be considered outside the safe zone, and an alert will be sent to you smartphone to indicate that you pet is away! When the pet is outside the safe zone, the tracker uses the GPS to detect the its location and sends the information to your smartphone via cellular data. Notification via the cellular data comes within a couple of minutes. Note that you can set multiple places using Wi-Fi to keep tabs on your pets from wherever you are, and get alerts when they get out. The maximum reachable distance by Bluetooth is from 30 to 50 feet, while the maximum reachable distance by Wi-Fi can go as much as 300ft. So, if you don't want your dog to wander away more than a maximum of 30 to 50ft, you should opt for Link AKC. And if you don't mind your dog to wander away as much as 300ft feet, then you can also select Whistle 3. To enable the GPS tracking, both Link AKC and Whistle 3 require subsription to AT&T cellular service plan. The service plan enables data to be transmitted from your pet’s tracking unit to a cellular network which is accessed by your smartphone app. Note that the GPS tracker's AT&T subscription plan is totally independent of your own cellular service plan. Monthly plans at $9.95 per month and billed each month. 20% savings by pre-paying annually a 1-year plan (equivalent to $7.95 per month). 30% savings by pre-paying bi-annually a 2-year plan (equivalent to $6.95 per month).. Both trackers come with iOS and Android apps that are free to download to your smartphone. Link AKC app is compatible with Apple iOS 9.0 or later, and Android 5.0 or later. ​Whistle 3 app is compatible with Apple iOS 10.0 or later, and Android 5.0 or later. With both trackers, when you pet wanders out of the safe zone defined by your configuration (see note 2 about safe zones), an alert wil be sent to your smartphone to indicate where it is. The alert can be in the form of email, app or text notifications. Link AKC will also send an alert to your smartphone when the ambient temperature around your dogs reaches a level that may be too hot or too cold for them. With Link AKC, as long as you are with your smartphone and within Bluetooth range of your dog, you can use the "Start Adventure" selection on your app to track the time and places you have been with your dog. You can also store with the location data any pictures you take during your "adventures". Using the "Current Adventure" or "View Past Adventures" selections on your app, you can view time, place and pictures related to your current and past "adventures". The app allows you to keep, erase or share your "adventures" and the related pictures. With Whistle 3, the "Trips" selection on you app will allow you to see a report of where your pet has been during the last 24 hours. Note that the "trip" data is erased after 24 hours and there is no way to store it or share it. The app includes a feature that activates a soft tone emitted from within the collar. The sound feature works when your dog is with you, connected to your smartphone via Bluetooth, and when your dog is away, connected to the cellular network. Therefore, the range is nationwide as long as you and your dog both have a cellular signal. This feature can be used not just to alert the dog but also for clicker training. The app includes a feature that turns on remotely an LED light on the tracker. This can be used to identify your dog easily in the dark as long as the pet is within visible distance. With this feature on Link AKC, you can store in your app any pictures you may take with your smartphone of your dog's vet reports or other papers related to your dog. IP67 Rating says that you can submerge the tracker in water that is at most 1m (3.2 ft) deep for 30 minutes. That makes these two trackers water resistant rather than completely waterproof. ​With Link AKC, a full battery is supposed to last at most 3 days if it is mainly used on its Bluetooth connection. The battery will drain much faster when the tracker uses cellular data to communicate. With Whistle 3, a full battery is supposed to last about a week if it is mainly used on its Wi-Fi connection. Note that for both Whistle 3 and Link AKC, when the tracker is connected to cellular data, considerably more battery power is used than when the tracker is connected to respectively Wi-Fi or Bluetooth. With both trackers, the app shows you the amount of battery left on the tracker. So which of the two GPS pet trackers is best for your pet tracking needs? If your pet weighs less than 15 lbs, you should consider Whistle 3, as Link AKC is a bit bulkier and heavier and may not suit very small dogs. Note also that Link AKC was not designed for cats. If you want your safe zone to have a radius of up to 300 feet, you should consider Whistle 3 which uses Wi-Fi to define the safe zone (Wi-Fi range is up to 300 feet). If you want your safe zone to be smaller than 50 feet, consider Link AKC which uses Bluetooth to define the safe zone size (Bluetooth range is about 30 to 50 feet). If you don't want to have to set up base stations to define the safe zones and just rely on your home's Wi-Fi for larger safe zones, then consider Whistle 3. If you want to be able to keep your adventure related data and pictures, you should consider Link AKC which allows you to store, share and erase all adventure relate dta and pictures. With Whistle 3 all data is erased after 24 hours and can not be shared. If you want your tracker to track the ambient temperature around your dog and generate alerts, then consider Link AKC. There is no temperature tracking with Whistle 3. Finally, if you want your tracker to generate a remotely controlled sound and have a remotely controllable light, then consider Link AKC. These feature are not available on Whistle 3.